Free DeliveryImperial Edwardian Monobloc Basin MixerFrom £220.00 inc.VATRRP: £275.00 (Save 20%)Classic monobloc basin mixer with pop up waste, chrome, nickel or gold finishes. Free DeliveryImperial Crown Lever 3 hole Basin MixerFrom £244.00 inc.VATRRP: £305.00 (Save 20%)The stylish, classic choice for a basin with three tap holes. Available in 3 finishes. 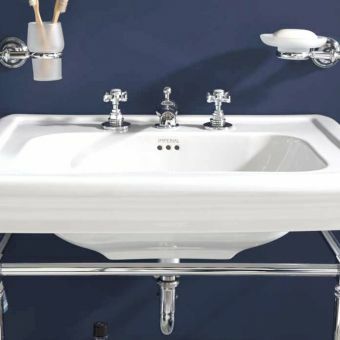 Free DeliveryImperial Victorian 3 Hole Basin MixerFrom £252.00 inc.VATRRP: £315.00 (Save 20%)Pop up waste included. Nickel, chrome or gold finishes to match any interior. Free DeliveryImperial Cou 3 Hole Basin MixerFrom £568.00 inc.VATRRP: £710.00 (Save 20%)Comes in 3 of finishes to match any decor, a classic stylish choice. Free DeliveryImperial Regent 3-hole Basin MixerFrom £244.00 inc.VATRRP: £305.00 (Save 20%)Smoothly curved lever handles set this basin kit apart from the crowd. Choice of chrome, nickel or antique gold. Free DeliveryImperial Niveau 3 Hole Basin Mixer TapFrom £724.00 inc.VATRRP: £905.00 (Save 20%)Distinctive square styling, choose from 3 colours. Free DeliveryImperial Westminster 3 hole Basin MixerFrom £248.00 inc.VATRRP: £310.00 (Save 20%)Complete with pop-up waste, choose from gold chrome or nickel. Traditional styling with white indices. Free DeliveryImperial Victorian Bath Shower MixerFrom £316.00 inc.VATRRP: £395.00 (Save 20%)Separate cradle with a handset for easy showering. 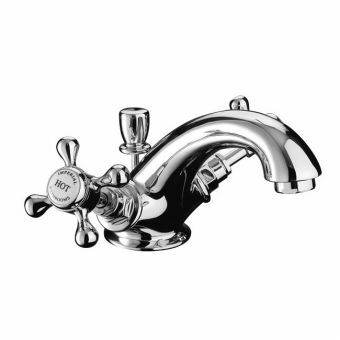 Characterised by the fluid and sculpted forms found within Edwardian and Victorian brassware, Imperial Taps and Mixers are constructed to the very highest of standards both within and without. Renovating your bathroom, en-suite or washroom is no simple task, especially given the investment you will be making in order to get it right. We understand that, and we know just how important each detail is to you. It's now time to start thinking about your bathroom taps and mixers, although these are often one of the first key decisions that people actually commit to in choosing a bathroom as they can influence so much of the space. They may seem like a small part of the overall bathroom, but they can make a big difference in the functionality, practicality and aesthetic. Therefore, it's worth taking the time to ensure you're making the right decision for your home. 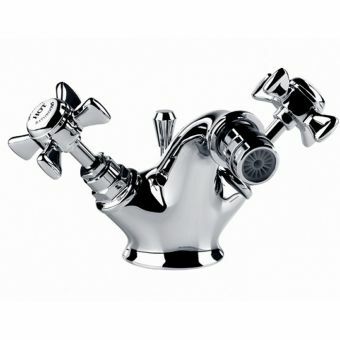 Imperial Taps come in half and three quarter inch fittings to give a ready match to the majority of pipes and plumbing. Fitted with ceramic valves and robustly made with all the best of modern techniques, Imperial's antique exterior is benefitted by contemporary design. 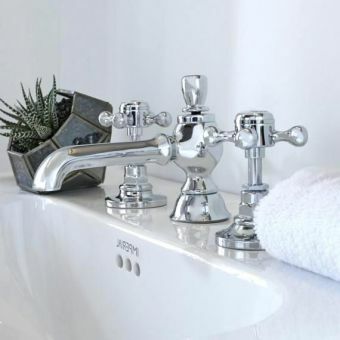 Beautifully rendered on the outside with cruciform tap heads, lever valves and authentic white or black ceramic details, they are the perfect foil for the baths, basins and bidets in the traditional style. 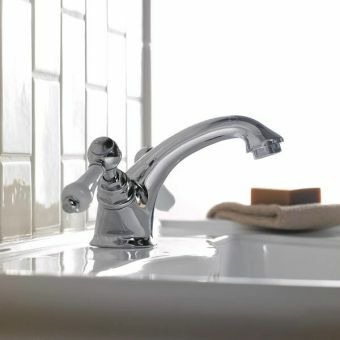 There are a number of different types of taps you can choose from, but one of the most simple rules to begin with, in your decision-making process is to match the size of the tap to the size of your bathroom. 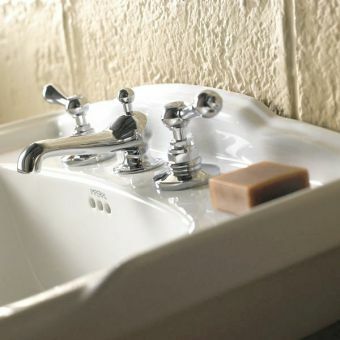 If you've got a small room and have opted for a small sink, then a smaller tap will be the right choice; and for larger basins, you'll want to get a larger fixture. 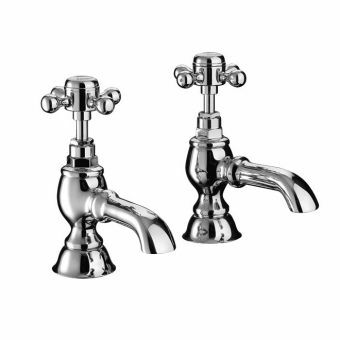 It's also important to think about your overall design style and Imperial taps and mixers are ready to match any traditional look. 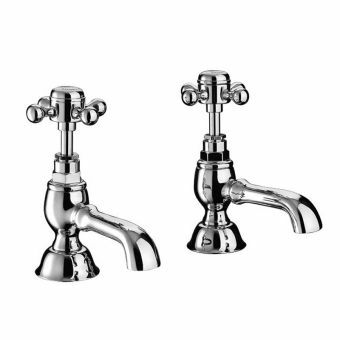 Characterised by the fluid and sculpted forms found within Edwardian and Victorian brassware, Imperial Taps and Mixers are constructed to the very highest of standards both within and without. 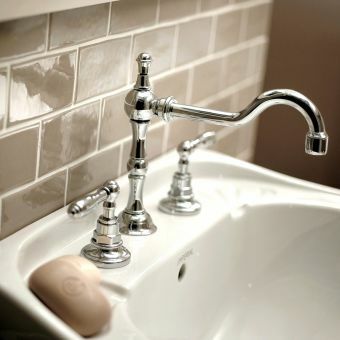 Rest assured, your taps follow through with this theme to create a cohesive look. Another key consideration is what your water pressure is like. Most taps will work okay with standard water pressure. 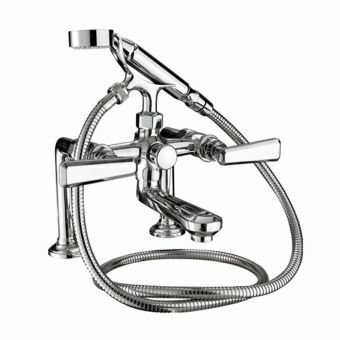 However, some shower mixer taps will require a higher pressure to perform. Therefore, it's good to know what your water pressure is like before you pick a tap to ensure it's one your space can handle. Most taps from Imperial will need high pressure to work correctly in line with today’s modern pressurised cylinders and instantaneous boilers. Imperial is a premium manufacturer of handmade products. They offer a great range of styles and designs. There's a wide variety of taps to choose from in their high-quality range, and lots of key considerations to be made. 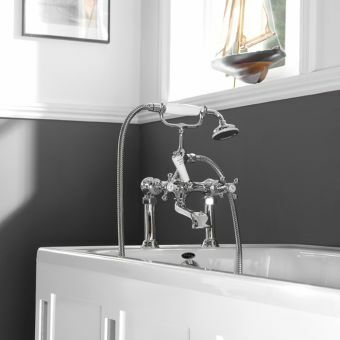 From mixer taps to double taps, it is important to explore the various options available to you - and know what style you like before you commit to your bath or sink. The type you opt for will affect how many tap holes you need in each unit. These taps are particularly ideal if you only have a small space or you're looking to go for a more modern, minimalist feel. These taps combine both the hot and cold feeds into one single unit. It's easy to control and the temperature can be manually changed by turning the tap handles. You can opt for deck mounted or wall fixed options in a range of styles. There is also a range of shapes that the basin mixer taps come in, from more curvaceous and rounded to angular and masculine. It's important to take particular note of each design as many styles can lead to additional decisions. For example, many have a number of sizes available to choose from, ranging from extra small to tall (best suited for countertop basins). Likewise, it is worth finding out whether the basin mixer tap you're interested in is energy efficient. If it is, this will mean only cold water will flow out when the tap is set to the middle position, ensuring your energy costs are reduced and you can use the hot water selectively. 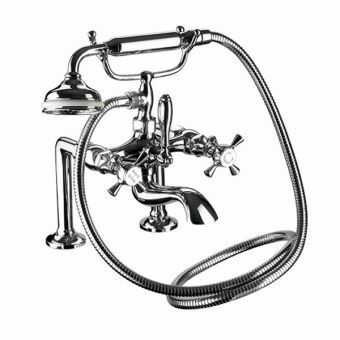 Dedicated to every level of detail, this series also includes beautifully rendered stopcock valves and kits, allowing you to attend to every last piece of pipework and plumbing in the bathroom. With these options, it is entirely possible to move away from unsightly, purely functional plumbing to achieve a coherent finish. 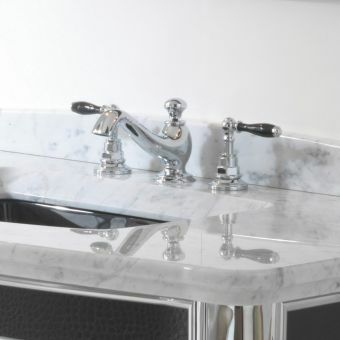 Basin taps are the traditional kind that we're most used to seeing. They come as a duo and enable you to separate the hot and cold water. These are ideal if you have opted for a basin with the standard two tap holes in it. 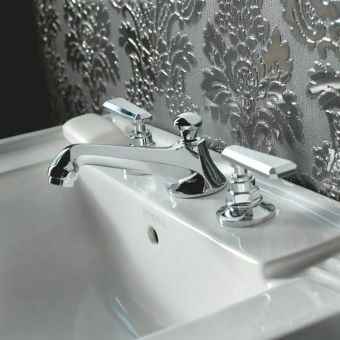 The Imperial ranges come in a variety of traditional designs (such as the Imperial Edwardian Basin Pillar Taps) but still have design flexibility within them. 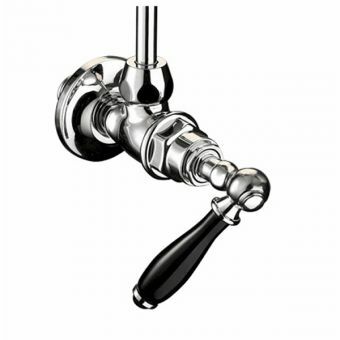 You can choose from the familiar screw tap to a classic lever design. Again, there are key considerations to be made including the size of the nose that you want to opt for, the minimum operating pressure and what the grip is like on them. 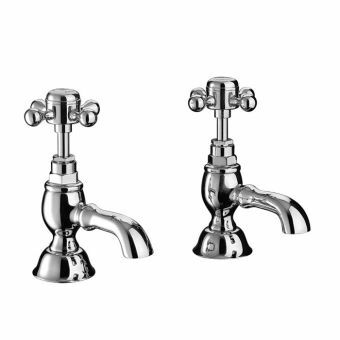 A short nose tap set is generally best for small basins or those in a cloakroom or en-suite. 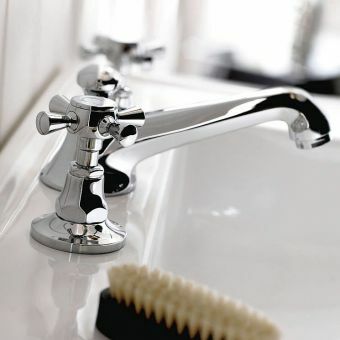 If you have a low-pressure water system, it is also worth checking which basin taps are best suited to your home. 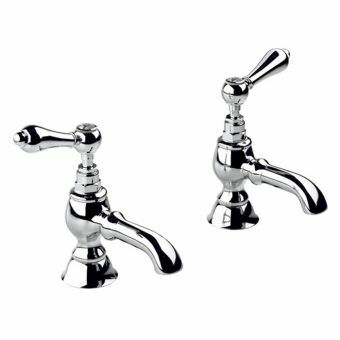 These taps are ideal for a bathroom in which you are planning on keeping your shower head at a lower fixed point against the side of the bath (rather than up high like a normal shower). 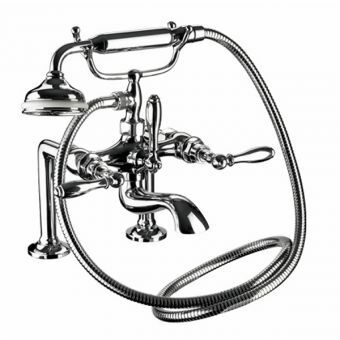 They combine both the shower head with the bath taps through a metal hose and often come with a handset cradle for the shower head to sit on. There are a number of different design choices to be made, not just with the taps but with the shower head too. From traditional to modern, there's something for every bathroom. 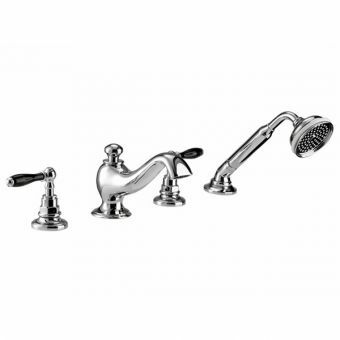 Some styles also come in a variety of materials; for example, the Imperial Cisne Bath Shower Mixer Kit is available in polished nickel, antique gold or classic chrome. 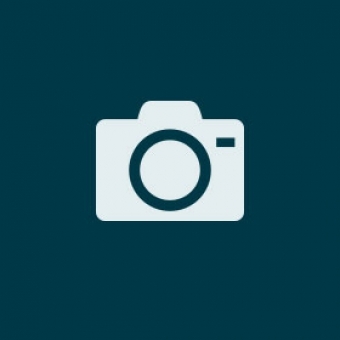 This helps to make it easier to match your taps to your design aesthetic. 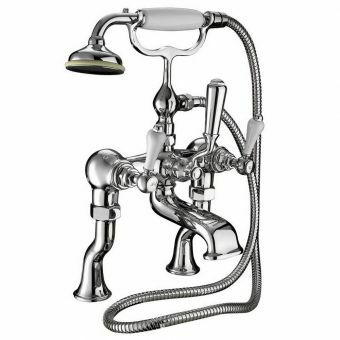 Likewise, the Imperial Niveau Bath Shower Mixer Kit offers standpipes in matching colours should these be required. In the same way as the basin mixer taps, the hot and cold water both come through the same place, combining the temperature before it reaches the bath. 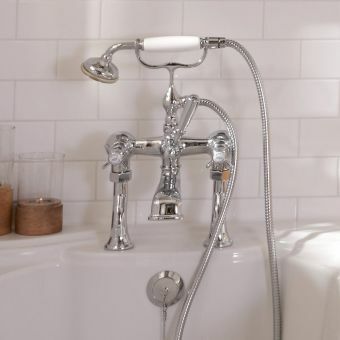 These types of taps are particularly useful in the bath as they allow for hot and cold water to be poured for a bath but also give the flexibility of a shower - useful when washing your hair and not wanting to use dirty bath water. They're ideal for small bathrooms or spaces with sloped ceilings where it isn't possible to fix a normal shower above the bath, or where the bath is freestanding and the taps are not directly next to the wall. 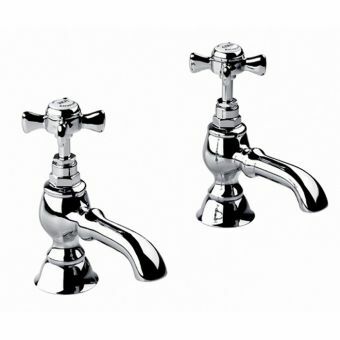 Bath taps are very much the same as basin taps and have two distinct taps that each emit hot and cold water separately. The difference is that they are designed specifically for baths rather than basins, so have different measurements for their fittings. 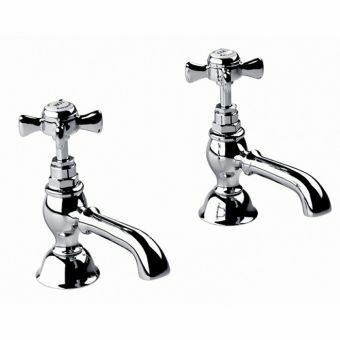 You can opt for a traditional cross head style tap or a lever handle. It's again worth checking your water pressure to ensure you will have speedy water pouring for your bath. There's nothing worse than a slow trickle that will see your water cold by the time you are finished. If you have opted to have a bidet fitted in your bathroom, then along with basin and bath fixtures, you will also need to consider this additional piece of furniture. Bidet mixer taps operate in the same way as their counterparts, combining hot and cold water in one single unit. 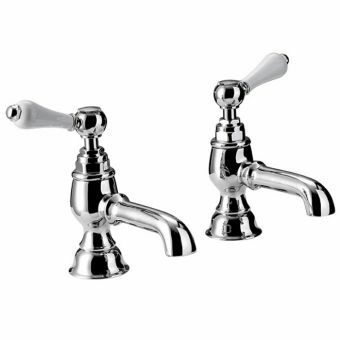 They have both a hot and cold water tap, and you can again choose between a lever design or a crosshead style handle. There are a number of considerations to be made when buying a bidet mixer tap. It is important to check when purchasing your bidet unit that it only has a hole fitting for one tap if you want a mixer style. 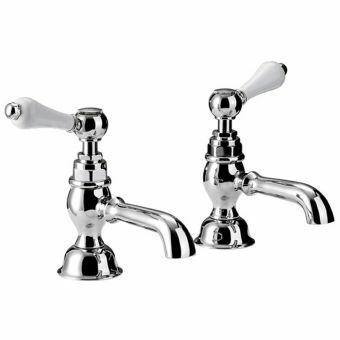 All of the Imperial range come with adjustable nozzles, which helps to regulate the direction of the water. This is a great feature to have to ensure your bidet works for you. There are also design considerations to be made. For example, the Imperial Victorian Monobloc Bidet Mixer comes in three different metal types: polished nickel, gold or chrome. 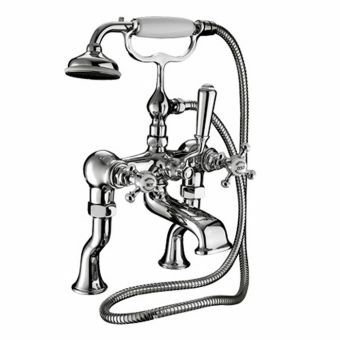 Likewise, the Imperial Niveau Bidet Mixer Tap with pop-up waste has a particularly art deco feel to its aesthetic. 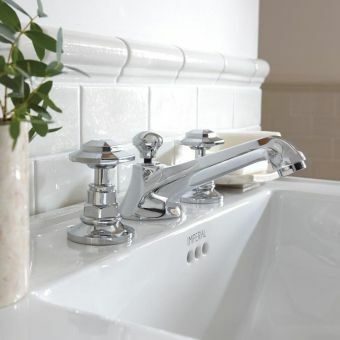 When choosing your taps, you may find yourself looking at basin fixtures and fittings as well. 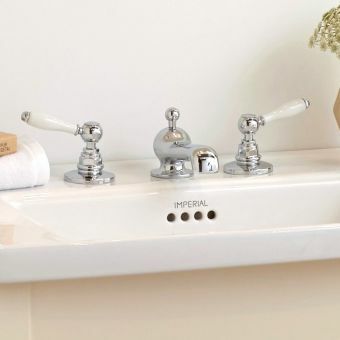 Imperial Bathrooms offer a stylish ceramic basin waste, a traditional basin P-trap and a 1-1/4 inch basin waste. These can help to add the perfect finishing touch to your sink or bath. If you're not sure what materials to choose between, don't worry. It's a lot to take in. It's worth keeping in mind that brass taps or gold taps are very traditional and suit a home that is working towards a country or Victorian theme. They have a warm, inviting finish and can make a room feel very opulent and grand. When it comes to cleaning them, it's ideal to do this regularly with warm water and a mild pH-neutral liquid soap. Once dry, buff them with a clean, soft microfibre cloth. Chrome taps can feel much more modern but will require a lot of effort to keep them looking good. If you have children, these are not so suitable as they will take a lot of your time up in trying to ensure they stay clean and looking nice. 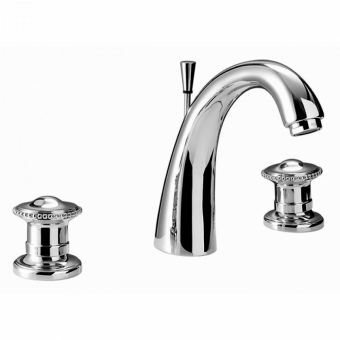 Polished nickel taps likewise require regular cleaning to keep them in good condition. Each day, wipe the fixture using warm, soapy water and a soft cloth, then drying and buffing it. 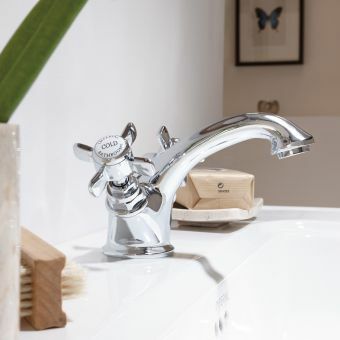 Get in touch today to find out more about the Imperial Bathrooms range of taps and mixers. Our experts will only be too happy to talk you through this high-quality brand.